Great trade ddaytrader, you nailed the low. 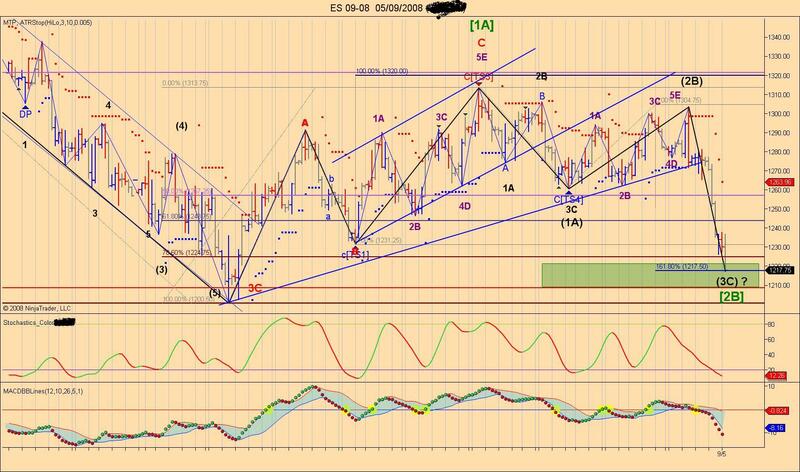 I had possible support at 1217.50 as this was 1.62% of wave (1A) and (2B) (black label. So it would seems that this provided a good support for the end of wave 3, too bad I sold all my lots earlier but I had a birthday party to prepare. I will try to upload the chart later on if I figure out how to . Just so you know who I really am, I am an experienced daytrader, but alas not a good one. I've only become profitable this year on a consistent basis and I am still working very hard at putting all this information, techniques, etc. together, which many of these regular posters have done, and helped me do (whether they know it or not)! I just want you to know who I really am and that I am learning as well. Good luck and thank you for your complement. Finally I was able to find how to upload as the window was too small for me to see the browse window. I don't know if I will have left money on the table, but anytime I can go +10.75 points profit/traded contract I'm happy. By the way, your charts are excellent! Did OD2 ever tell us what exactly he thought the market was going to do today? First, I want to say that I am a friend of Rich's and I am a subscriber to his eBook. Secondly, I want to state that I have no interest, financial or otherwise, in Rich's service. My only interest in his service is that he continues to offer it. Today, TTT set my expectations for a lower low and then a rally, preferably to a price at, above, or just below the Buy Day low. The fact that price didn't reach that level is not a failure by TTT. The fact that the ES traded to a lower low than that projected by the averages over time is not a failure by TTT. TTT gave any trader who uses it properly the "heads up" that a tradbale rally was likely to form during the day, and that such a rally would be more likely to occur than a tradable decline. Using a set up that I have been using for years based on Fibs, Support/Resistance and momentum observations, I was twice able to go long. The first trade yielded 10 points profit on 1/2 of the position, and -2 points on 1/2 of the position. The second trade yielded +10 points on 1/2 of the position and +24.75 pints on 1/2 of the position. TTT did not provide me with the set-ups. TTT did not tell me "when" or at what price to go long (though, on some days, a TTT projection coincides with an important fib level or Support/Resistance level, and thus confirms a level as one from which a tradable move may commence). TTT helps you find the rhythm of the markets, and, if you study it and learn it and understand that it is a method, not a system, it will help you determine whether you should be looking more for long trades or short trades on a particular day. I agree with your opinion of TTT. You are able to put things into words very well. Congradulations on a good day.